After writing my last quilling flower tutorial about daffodils and flower buds, I decided to go bigger this time. 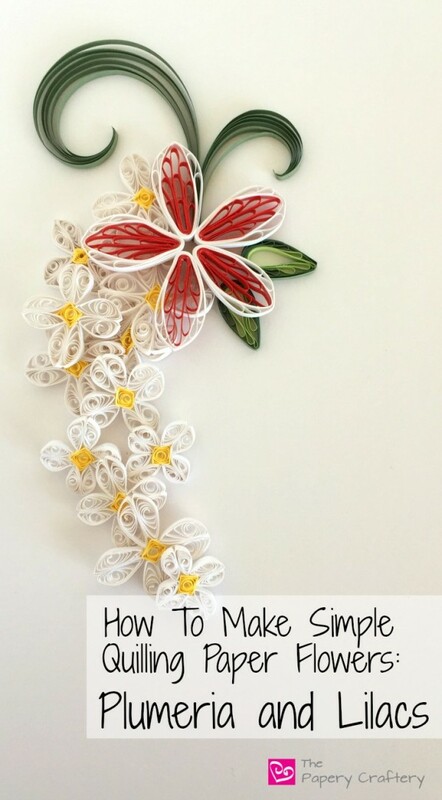 So, for this post on how to make simple quilling paper flowers, I chose the plumeria and lilacs. The plumeria is much larger in size and the lilacs grow in mass quantities. Everything is just bigger this time! While there are lots and lots of ways to quill large petaled flowers like the plumeria, some get incredibly fancy, and my theme for this series is still simple. That being said, my usual tutorial style wouldn’t be enough for the plumeria. This flower needed a video demo! Enjoy! When you’re all done, dress up your flower with some swirls and leaves, and that’s all you need! As for the second flower in this how-to, I chose the delicate lilac. Again, they can be found in many shades of pinks, purples and blues, but I chose crisp white. For my lilacs, I used 8 strips of 6″ white paper and 4″ of pale yellow for each flower. Roll the yellow into a loose coil, then press into a square. (As always, here is a quilling shape reminder!) I like to really push the corners on these squares to extend them a little bit. I’ve found it helps the petals adhere a bit more. After the center is done, roll each of the white strips to loose coils. Once the glue has had a moment to set, pinch each white coil into a half-circle, but make them slightly uneven. The bump should be more towards one end, instead of right in the middle. Next, glue two of the white half-circles together, leaving the thinner, pointy ends unglued. Some may be slightly larger than others, but I try to pair them up the best I can. It’s no big deal for the petals to be slightly different sizes. Nature is imperfect! I like to use straight pins to keep the two halves of the petals together as they dry. The shape seems to keep a bit better when they’re held in place. After the petals have set, apply a little glue to the end that remained open and place one on each of the four corners of the yellow square. Lilacs grow in bunches of lots of flowers, so get quilling! Use these flowers together or on their own. Maybe add in some of the daffodils or buds from the first tutorial in this series on simple quilling flowers! I’d love to hear how your flowers came out! Leave me a comment below to tell me all about it!